This post comes from Brent Schooley at the Infragistics Blog. It’s been a while since I have done one of these, but I’m back with another great HTML5 resource for you today. Today’s resource is CSS-Tricks. Although CSS-Tricks is primarily known for its namesake tips and tricks for doing cool things with CSS, the site offers many other things modern web developers might find useful. Read on to see what this site has to offer you. The gallery section of the site is a collection of images that show off sites that use creative CSS. These can be browsed by tags, so if you are looking for a particular type of CSS trick this might be a good way to find it. Each item in the gallery links to the original website so you can explore what they did to accomplish their design. There are a ton of video guides in the video section of CSS-Tricks. In fact, the latest one is #126. These are definitely worth checking out if you are the type that learns well from video. The Almanac is a CSS reference that is broken up into CSS Selectors and CSS Properties. It is set up like an alphabetized index and allows you to quickly look up the definition and examples of anything listed in it. There are many things like this on the web, but this one is pretty informative. 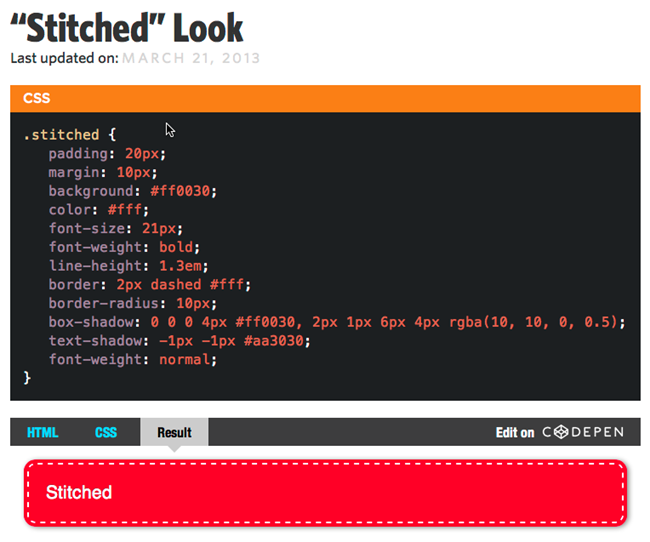 CSS-Tricks is a great resource for the modern web developer. It contains a ton of useful snippets, demos, and videos. I would subscribe to this one and spend a few hours going through it. I guarantee you will find something useful here. If you want to comment or reach out to me, the best place to do that is on Twitter @brentschooley. I can also be reached via email at bschooley@infragistics.com.